Known to many for his excellent recordings and concerts under the name "Anomalous Disturbances", Terrence O'Brien is a musical seeker - always looking to discover new capacities. 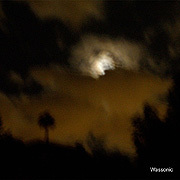 Wassonic (54'58") is the self-titled collaborative debut CD between O'Brien and long-time friend Matthew Poulakakis. This music seems as if it was not played but rather it unraveled - in three ample tracks. The album is laid out in an interesting way - starting off with the most kinetic realization. For over 20 minutes "Factory Florist" consistently pushes its way through a sonic landscape of dense black drones, icy synth strings and pulsing ethno-digital grooves. O'Brien's torrid guitar fills out the narrative. Either shrieking through a pitch shifter or sustained by e-bow, his fluid lead lines are confident - even as the imagery darkens under the uncertainties of a primordial electric jungle. The mood slows a bit on "Tree Frog Poison", as the steady forward motion of loping percussion loops and chirping electro-modulations reduces the urgency wrought by the previous track. But dark modulating chords and filtered guitar treatments hold the mood beneath a looming atmosphere. The gentle "Signalfish" brings the experience to a close. As the listener moves into this sonic sanctuary the rhythms are left behind and we drift easily through Wassonic's eco-textural realm. From a darkness which has never seen the sun to heated treks through a lost world Wassonic exerts a surprising grip on the listener. For O'Brien and Poulakakis this music is an involvement in an exercise which offers a sense of personal and artistic renewal. Their significant work, and others like it, is symbolic of an unseen dimension of existence.